Stray cats are the true kings of the world. Domesticated cats are only the kings of the house they live in; stray cats have the freedom to wander. And often, a cat comes along and attempts to seduce you with its tail. Down the neck, up its neck, onto its forehead, where its eyes squint in joy. Down its neck again, and it changes posture. Then, without any reason, it leaves. Did you not give a good massage? I saw it walk down the path, where it found another human, who called at it. “Meow“, he said. True enough, it got another massage. It didn’t stay so long with him, though. 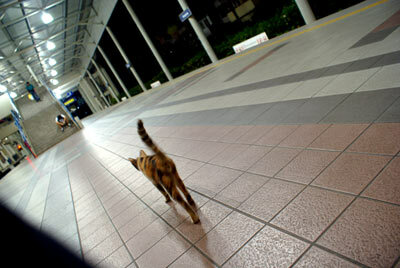 And as I waited for the STAR LRT to come, I thought, how great it is to be a cat! You just walk about and you get free massages. This entry was posted in General, Pictures on October 2, 2007 by 2konbla. where’s the cats pictures from klcc parkkkkk!!??? btw, come join us at Annexe CM on 6 Oct, OK!